Realm of Horror - News and Blog: JAMES KERMACK’S short, “BUCKING HELL” – Amazon release info and teaser trailer. 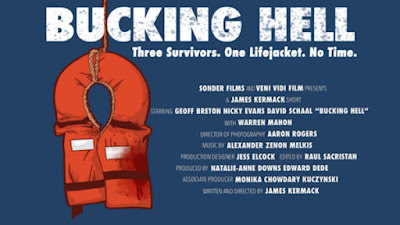 JAMES KERMACK’S short, “BUCKING HELL” – Amazon release info and teaser trailer. Ahead of the release of JAMES KERMACK’S debut feature, “HI-LO JOE” comes “BUCKING HELL”. , Down Terrace), GEOFF BRETON (The Rotters Club, Secret Diary of A Call Girl), NICKY EVANS (Shameless, Before Dawn) and WARREN MAHON, play a deadly game to decide who gets the last lifejacket. Bucking Hell - Teaser from 24 Foot Square on Vimeo. BUCKING HELL is released exclusively through 24 FOOT SQUARE - SHORT SUBJECTS via Amazon in the UK and US on 27th October. The film hasn't been submitted for festival screenings and this is the first and only way to see the film. James’s debut feature HI-LO JOE is released in UK cinemas on November 24th 2017. The psychological drama features Gethin Anthony (Game of Thrones - HBO, Aquarius - NBC), Tom Bateman (Murder On The Orient Express with Kenneth Branagh, Snatched with Amy Schumer), Thaila Zucchi (Shameless - Ch4), Joe Dixon (Rise of The Footsoldier, The Mummy Returns) and introduces breakout star Matthew Stathers as the title character Joe. It was selected to be part of Film London Breakthrough, playing at the 2016 BFI Film Festival. It made its World Premiere at the prestigious 27th Dinard British Film Festival (2016) and has continued to be selected for festivals worldwide since.